Grahamstown is known as the City of Saints and is located in the Eastern Cape allocated under Makana municipality. The population of this city was 41,799 of which 77.4% were black, 11.8% Coloured, 10% white, and 0.7% Asian. Since 1994, there has been a considerable influx of Black people from the former Ciskei Xhosa homeland, which lies just to the east. The city proper has an overwhelming white majority, while the neighboring townships (geographically separate, but tied together politically) have growing Black or Coloured majorities. Located some 130 km from Port Elizabeth and 180 km from East London, Grahamstown is the seat of the international known institution Rhodes University, a diocese of the Anglican Church of Southern Africa and home to the College of the Transfiguration the only residential provincial college of the Anglican Church in Southern Africa and a High Court. However it does not form part of the South African Cities Network. Located some 130 km from Port Elizabeth and 180 km from East London, Grahamstown is also the seat of Rhodes University, a diocese of the Anglican Church of Southern Africa and home to the College of the Transfiguration the only residential provincial college of the Anglican Church in Southern Africa and a High Court. However it does not form part of the South African Cities Network. Grahamstown was founded in 1812 as a military outpost by Lieutenant-Colonel John Graham as part of the effort to secure the eastern frontier of British influence in the then Cape Colony against the Xhosa, whose lands lay just to the east. On 22 April 1819 a large number of Xhosa warriors, under the leadership of Nxele (or Makana), launched an attack against the British colonial forces. The Xhosas warned Colonel Willshire, the commanding officer, beforehand of their planned attack on Grahamstown, brought about by the continued harassment of Xhosas within their own territory by the British authorities. The Xhosas came close to taking the town, but were repulsed by the heavy artillery and gunfire of the British, suffering heavy losses. Nxele surrendered, was taken captive and imprisoned on Robben Island. On Christmas Day, 1819 he tried to escape, and drowned. Grahamstown grew during the 1820s as many 1820 Settlers and their families left farming to establish themselves in more secure trades. In 1833 Grahamstown was described as having “two or three English merchants of considerable wealth, but scarcely any society in the ordinary sense of the word. The Public Library was a wretched affair. In a few decades it became the Cape Colony’s largest city after Cape Town. It became a bishopric in 1852. It was traditionally the capital and cultural centre of the Albany area, a former traditionally English-speaking district with a distinctive local culture. In 1872, the Cape Government Railways began construction of the railway line linking Grahamstown to Port Alfred on the coast, and to the developing national railway network inland. This was completed and opened on 3 September 1879. Grahamstown was the location of the testing of the first diamond find by Henry Carter Galpin. In 1904 Rhodes University College was established in Grahamstown through a grant from the Rhodes Trust. In 1951 it became a fully-fledged University, Rhodes University. Today it provides world-class tertiary education in a wide range of disciplines to over 6,000 undergraduate and postgraduate students. With the establishment of the Union of South Africa the Grahamstown High Court became a Local Division of the newly formed Supreme Court of South Africa (under Cape Town). On 28 June 1957, the Eastern Districts Court, under the name Eastern Cape Division, became a provincial division. In certain other areas of provincial government Grahamstown similarly served as a centre for the Eastern Cape. St. Michael and St. George Cathedral is the seat of the Anglican Diocese of Grahamstown. Grahamstown also has Roman Catholic, Presbyterian, Ethiopian Episcopal, Methodist, Baptist, Pinkster Protestante, Dutch Reformed (Nederduits Gereformeerde Kerk), Charismatic, Apostolic and Pentecostal churches. There are also meeting places for Hindus, Scientologists, Quakers, The Church of Jesus Christ of Latter-day Saints and Muslims. For historic reasons, particularly the vibrancy of evangelism during Grahamstown’s heyday, the City is home to more than forty religious buildings, and the nickname the “City of Saints” has become attached to Grahamstown. However, there is another story which may be the source of this nickname. It is said that, in about 1846, there were Royal Engineers stationed in Grahamstown who were in need of building tools. They sent a message to Cape Town requesting a vice to be forwarded to them from the Ordnance Stores. A reply came back, ‘Buy vice locally’. The response was, ‘No vice in Grahamstown’. 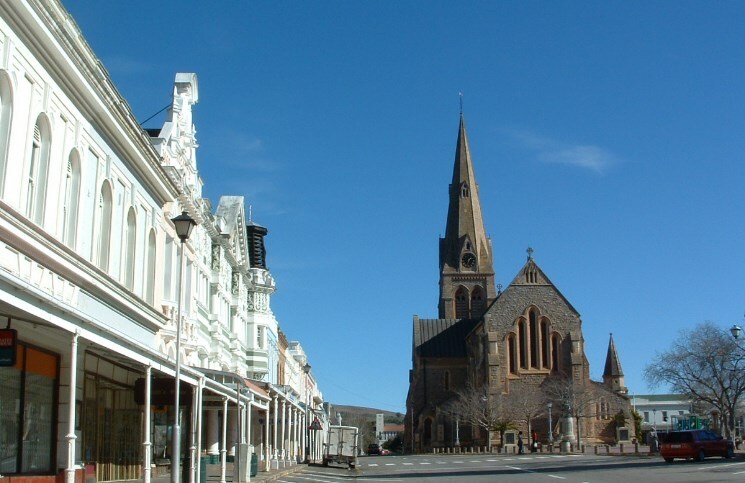 Grahamstown has 52 churches of numerous denominations, gaining it the name the City of Saints. Grahamstown is home to many schools as well as Rhodes University. It is also home to several institutes, most importantly the South African National Library for the Blind, the National English Literary Museum, the South African Institute for Aquatic Biodiversity (formerly the JLB Smith Institute), the International Library of African Music (ILAM), and the Institute for the Study of English in Africa. The effects of Apartheid still affect the provision of secondary education in this former frontier town, where significant discrepancies in matric pass rates and general quality of education exist. Addressing this problem is one of the city’s greatest challenges.